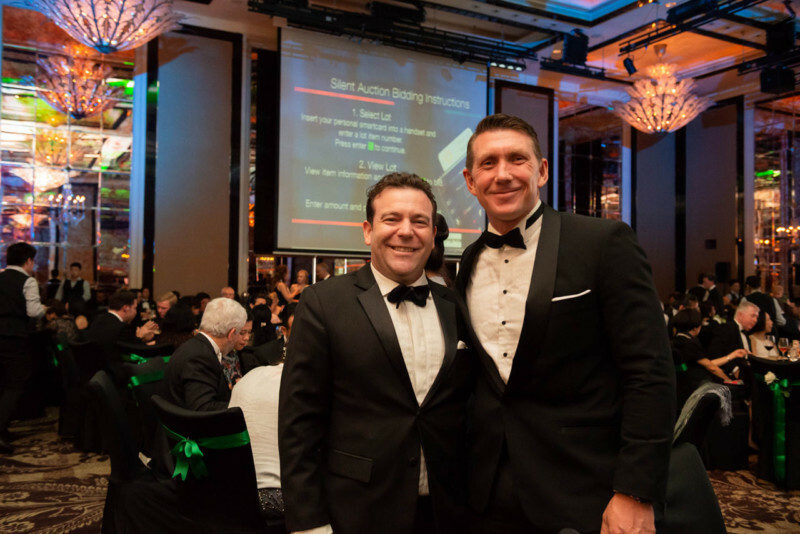 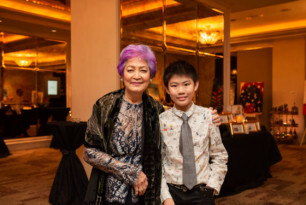 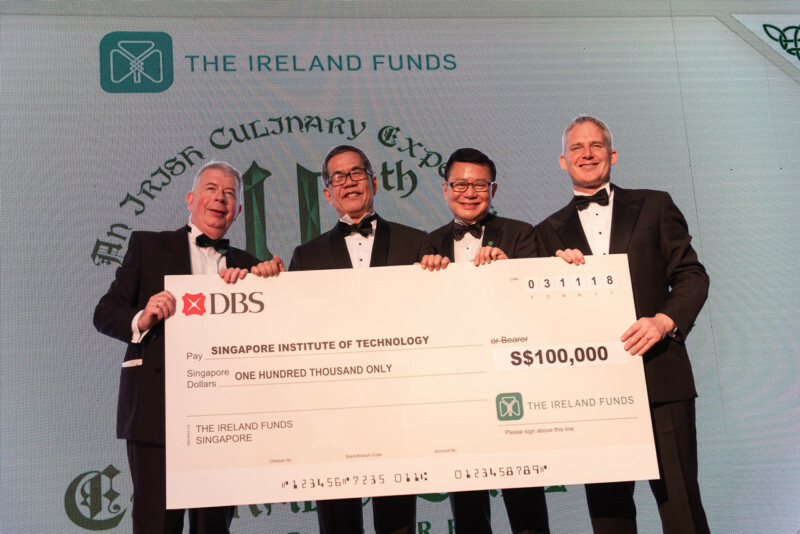 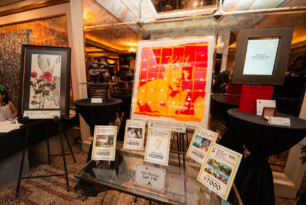 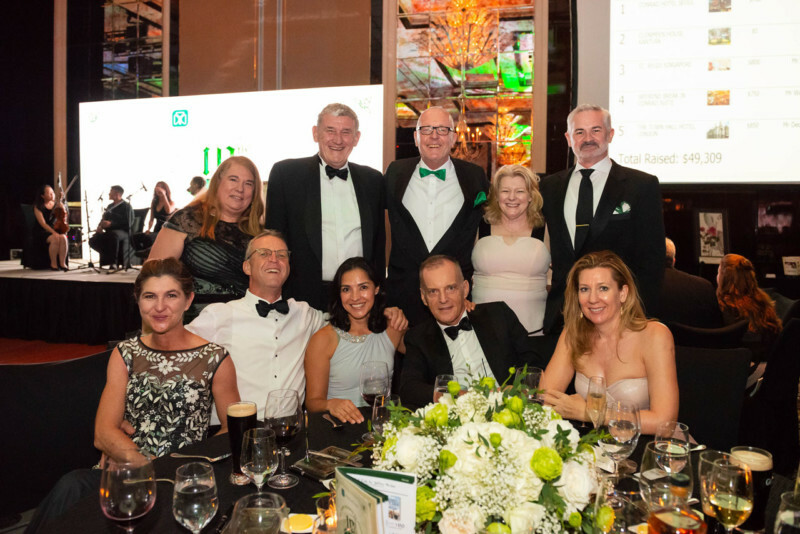 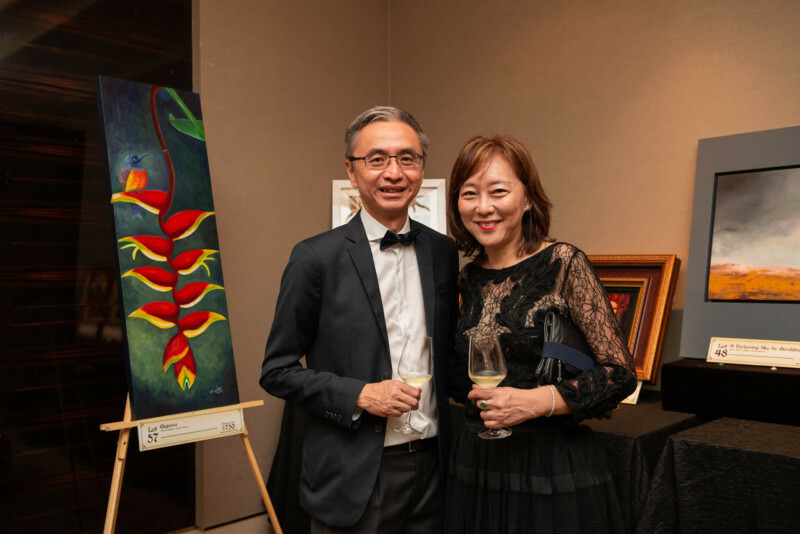 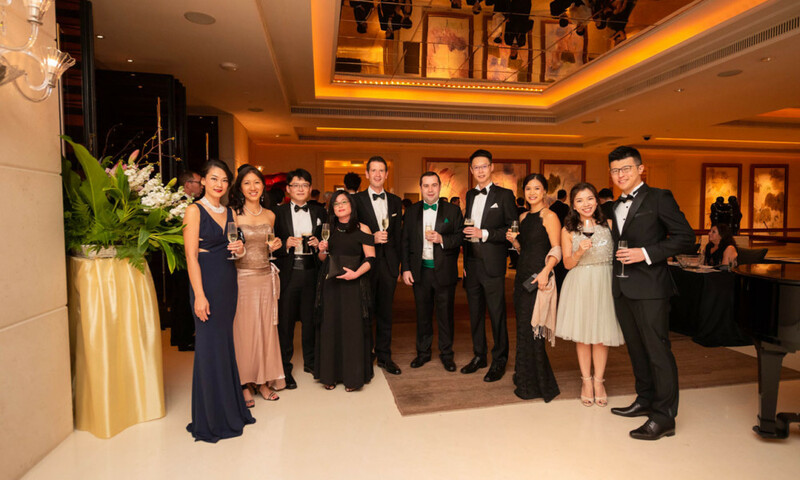 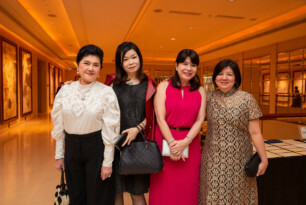 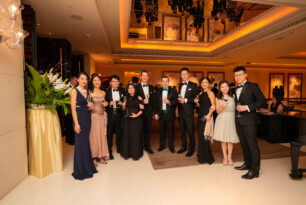 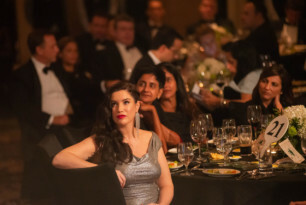 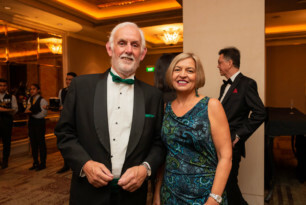 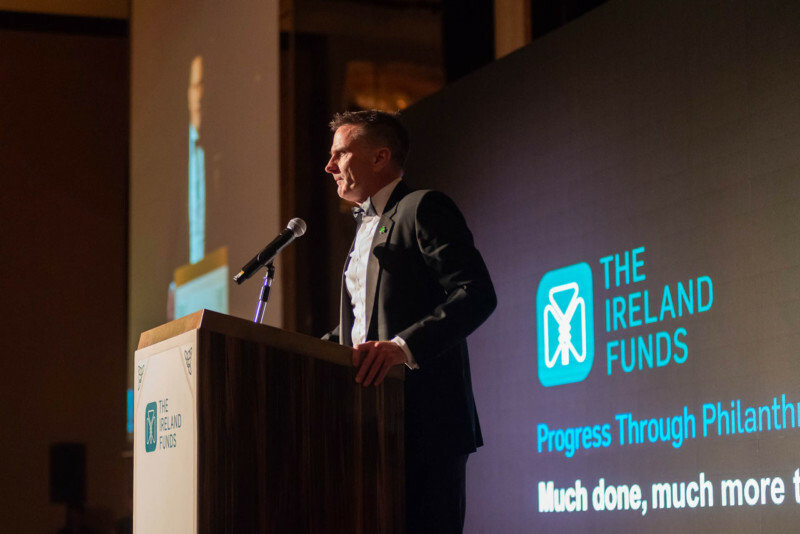 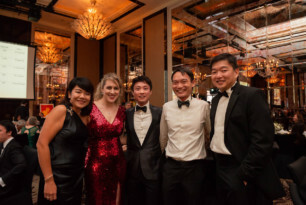 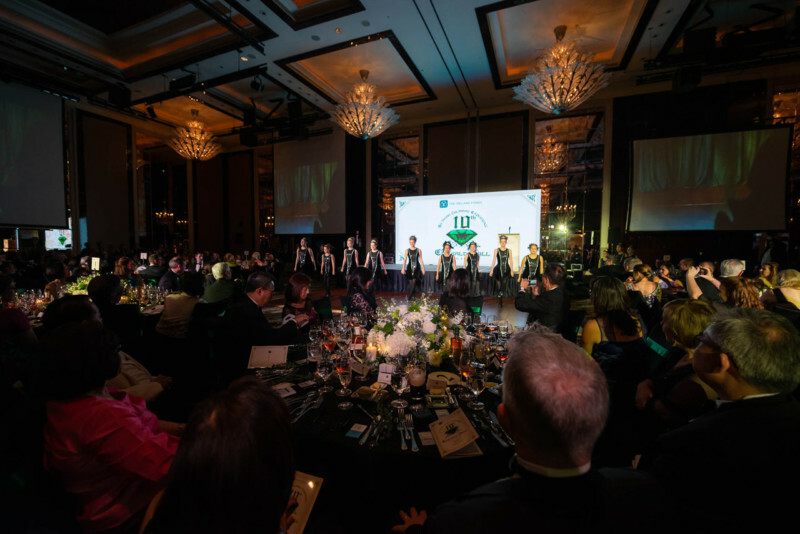 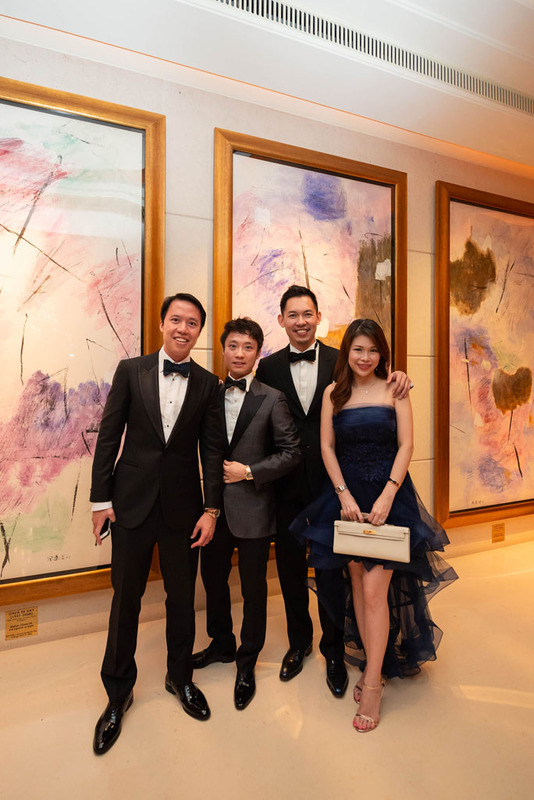 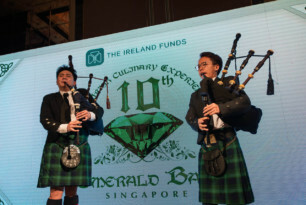 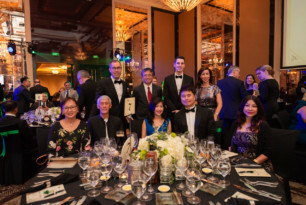 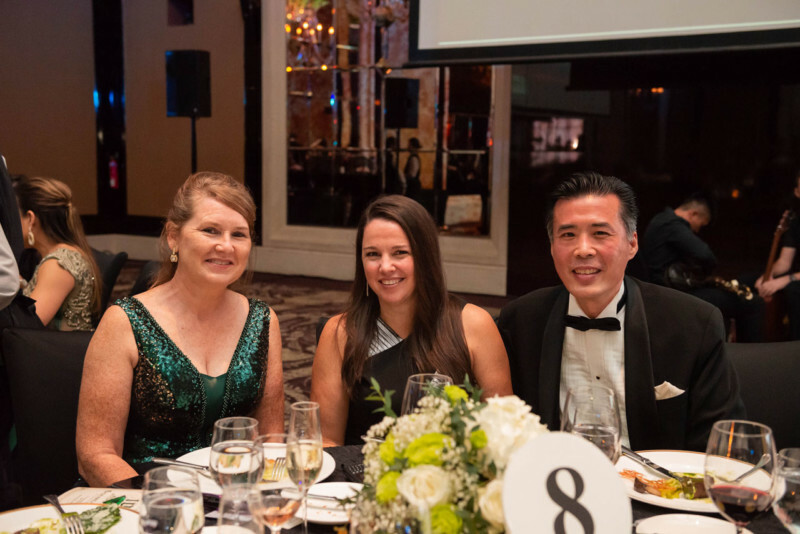 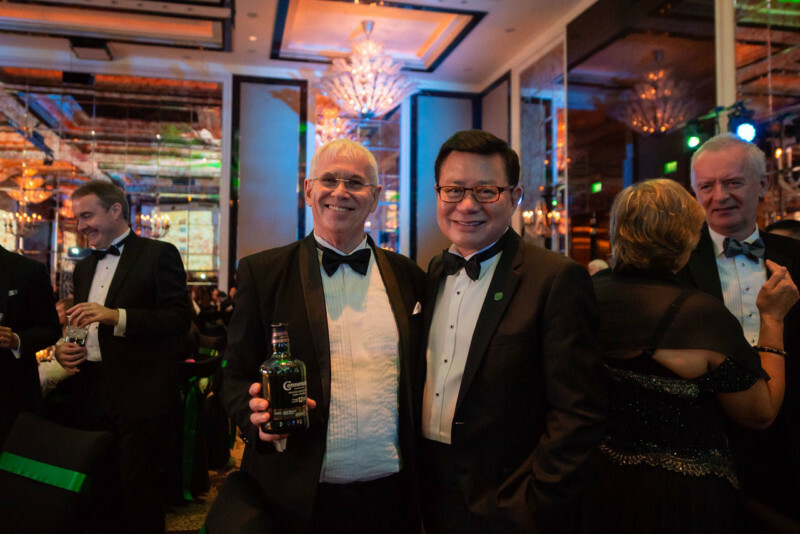 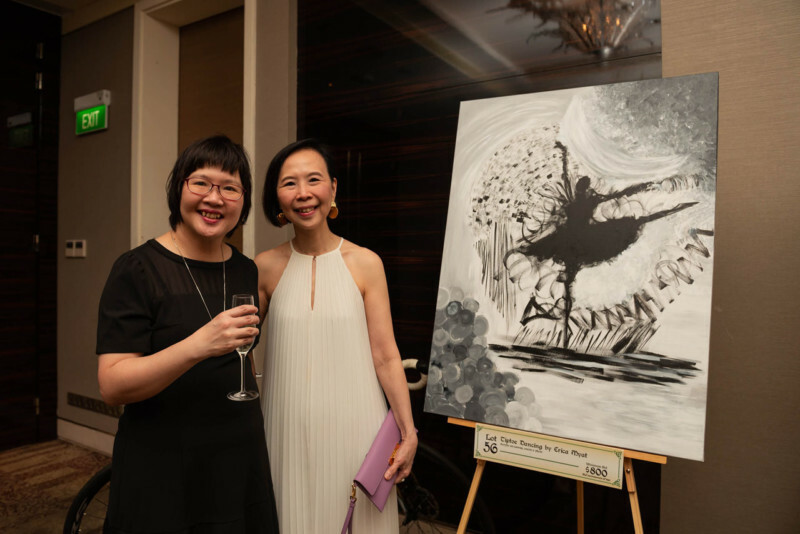 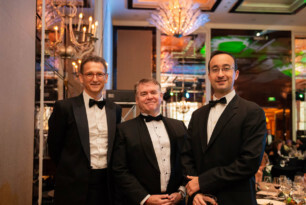 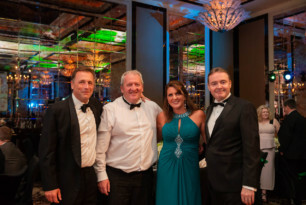 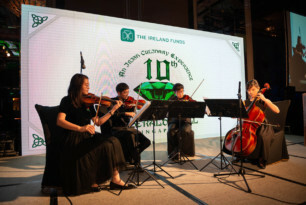 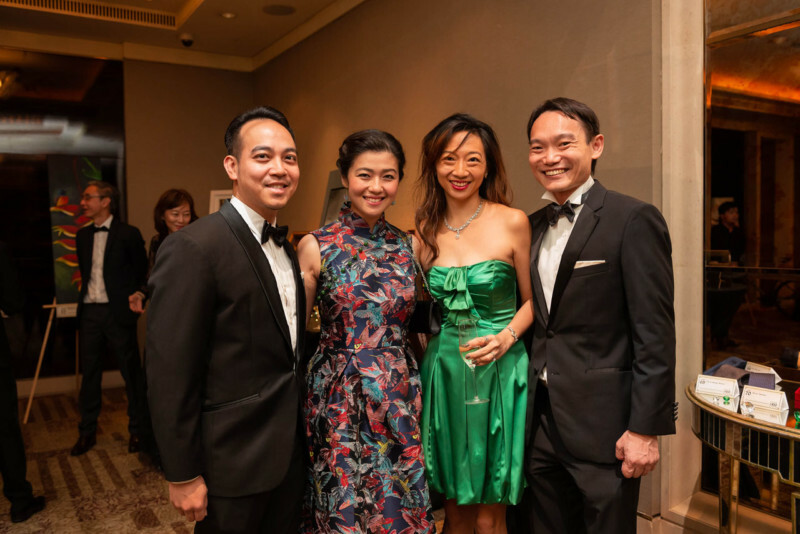 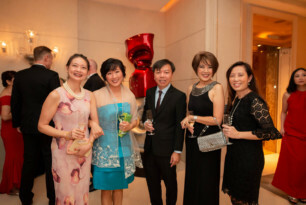 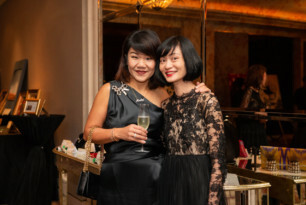 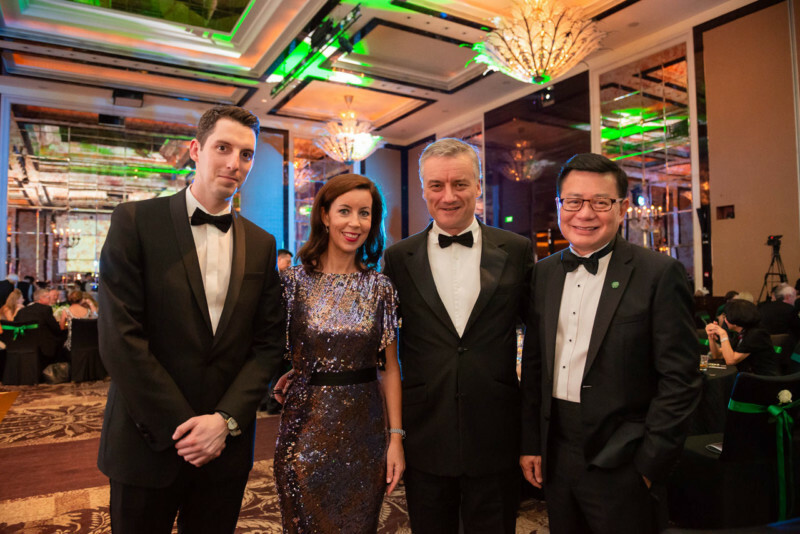 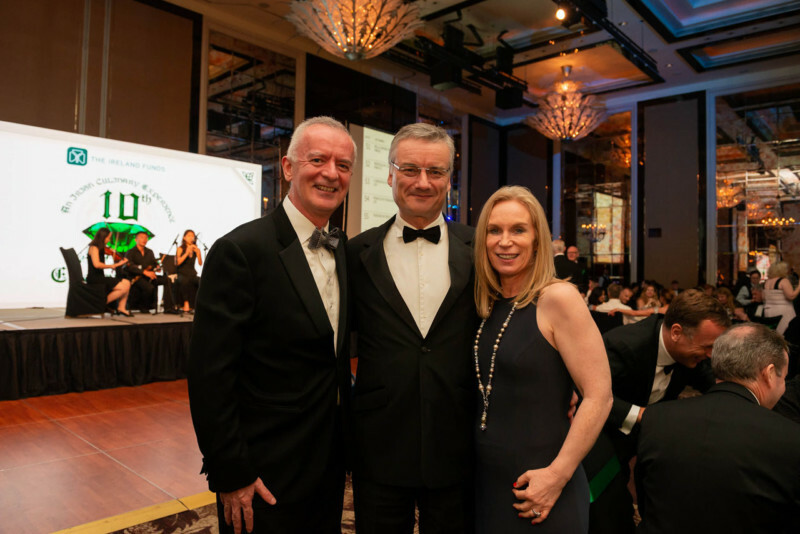 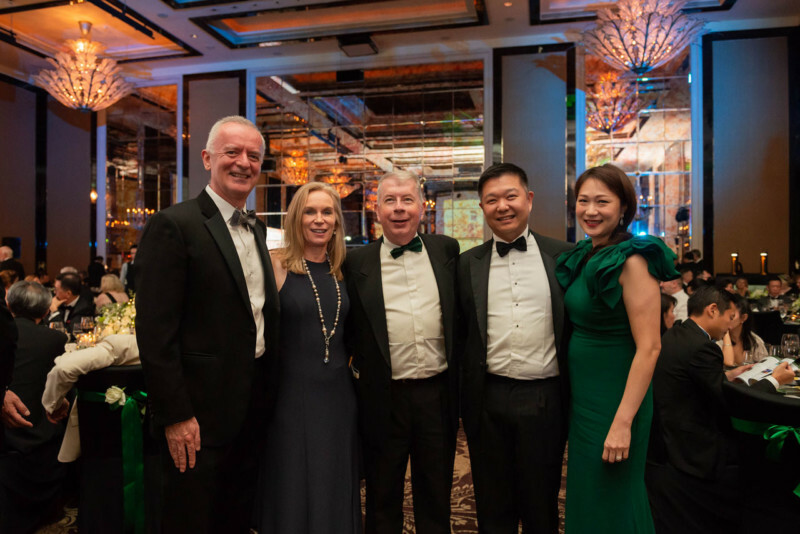 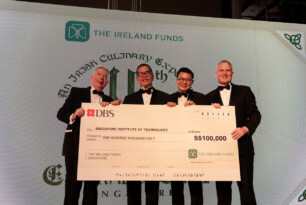 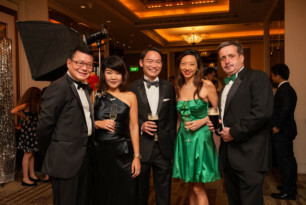 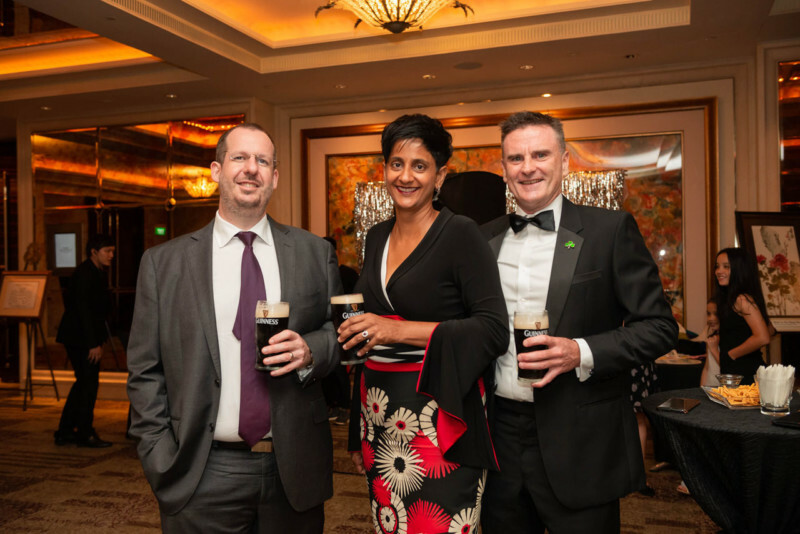 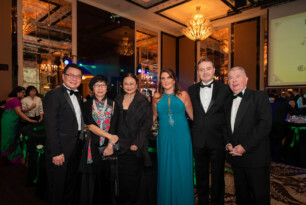 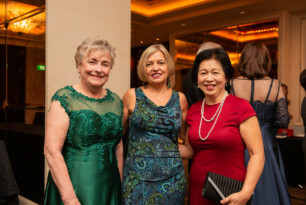 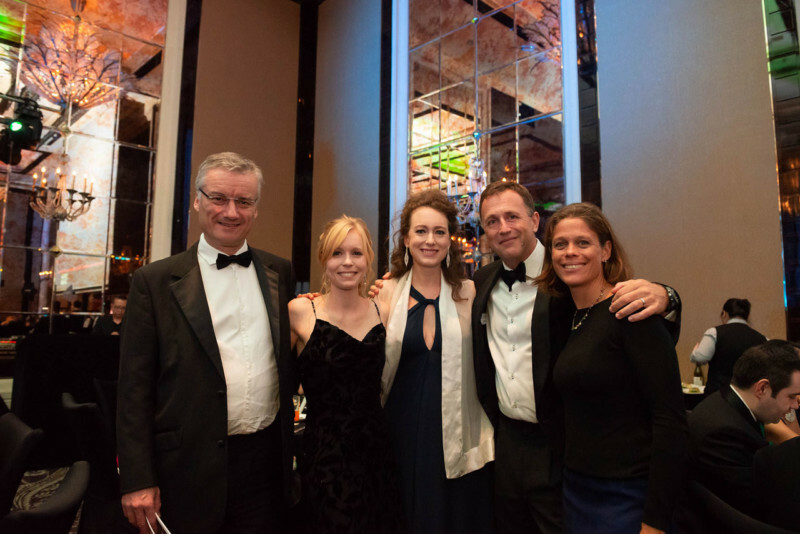 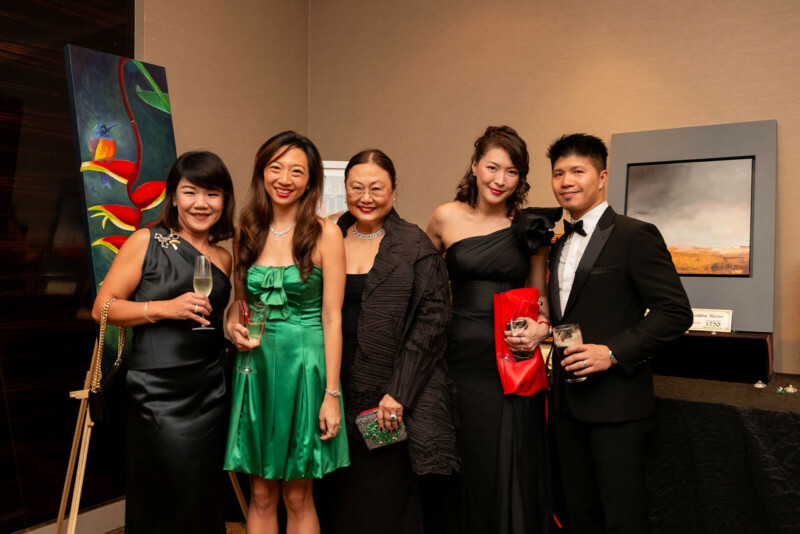 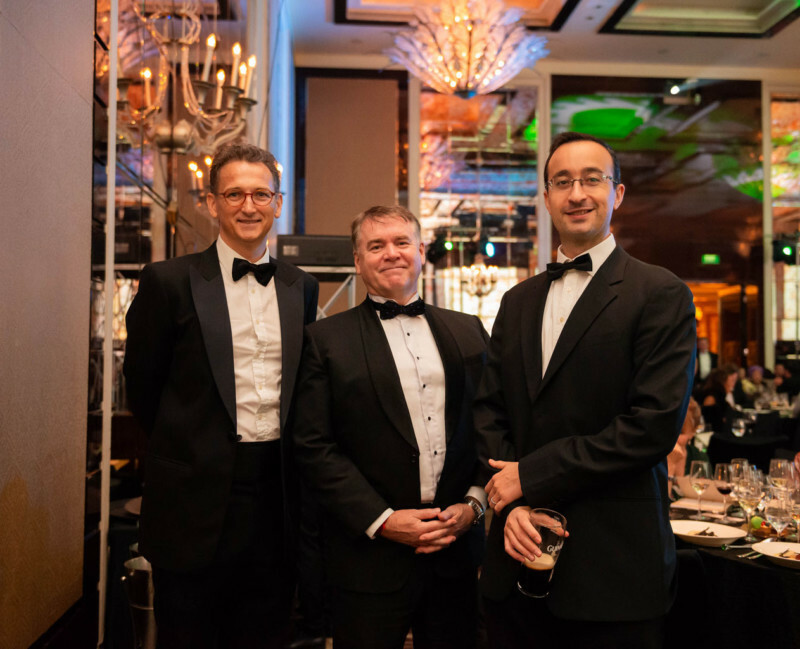 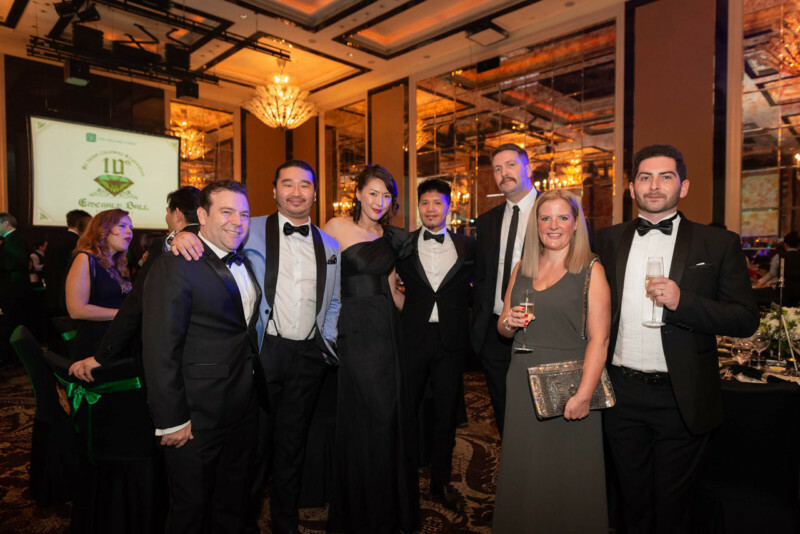 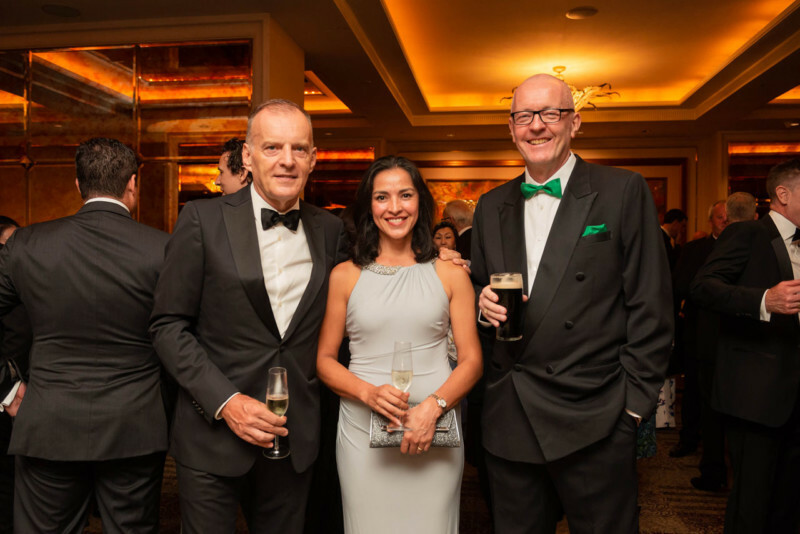 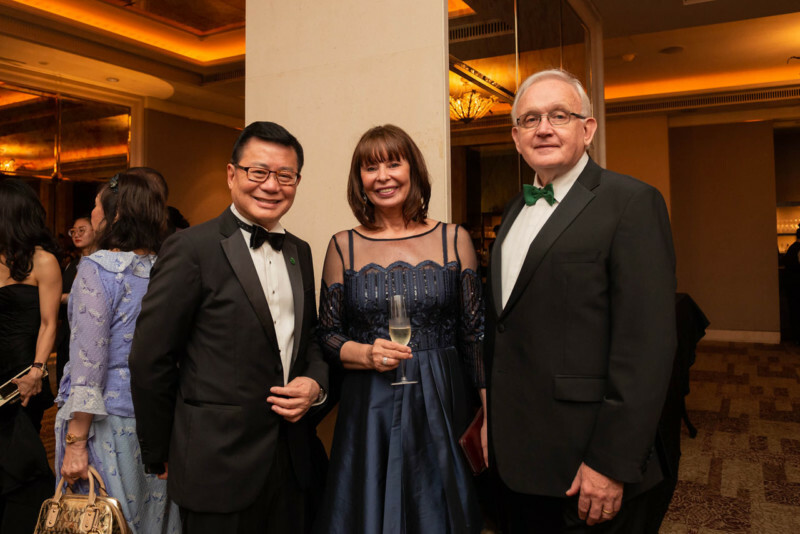 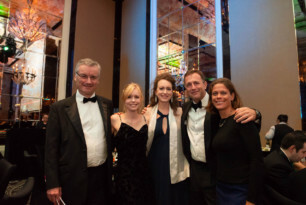 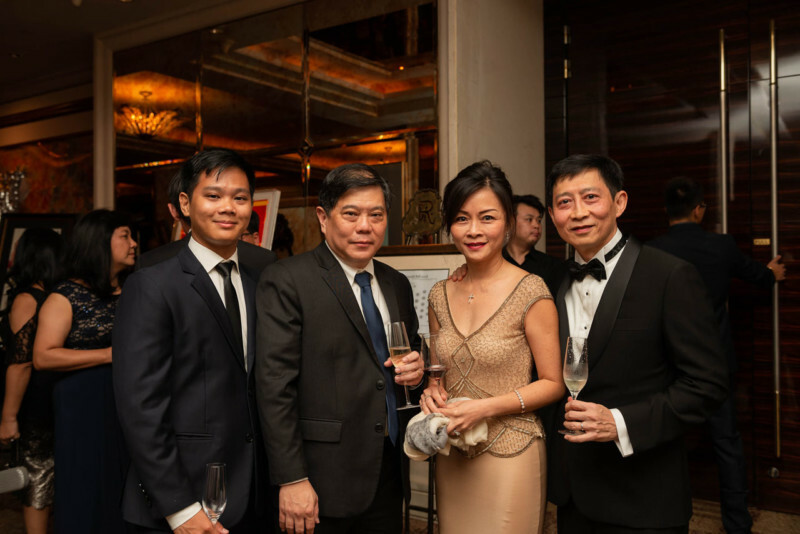 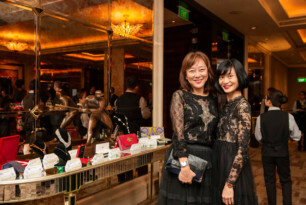 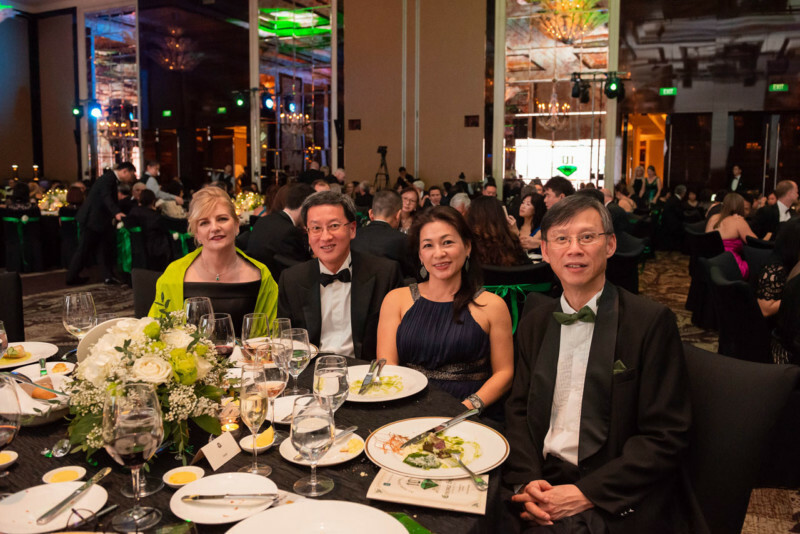 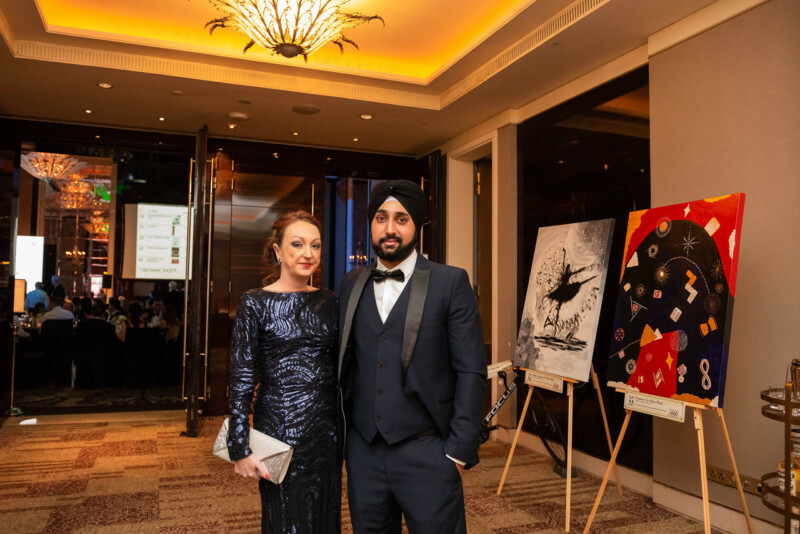 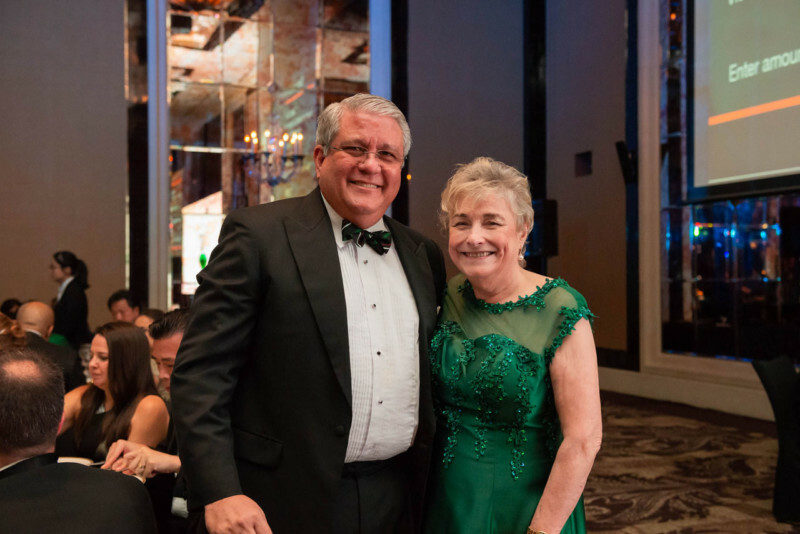 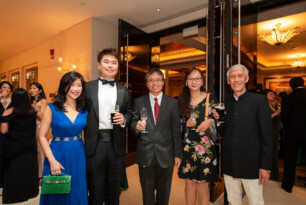 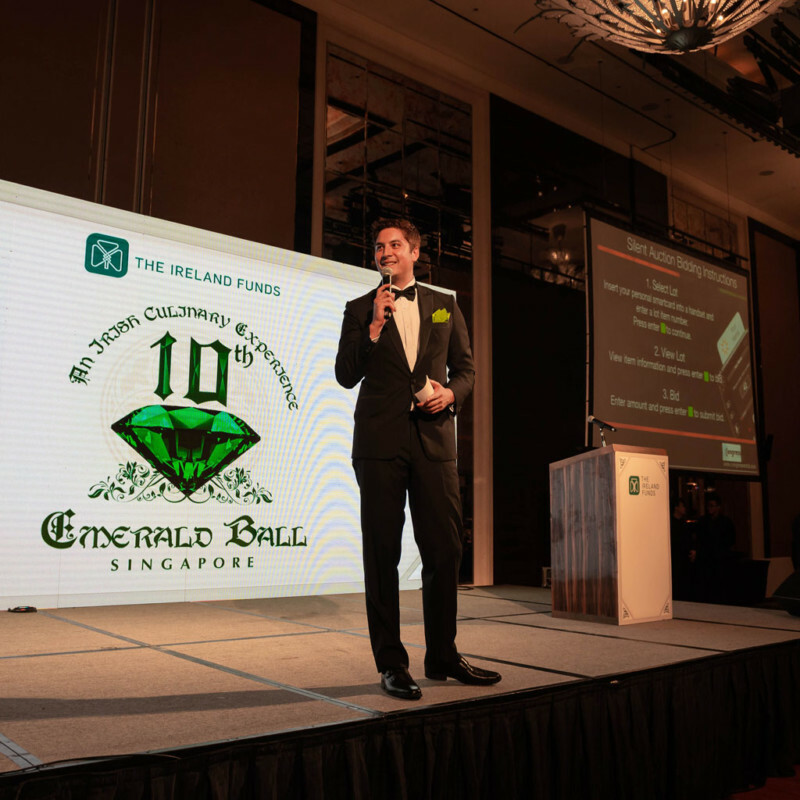 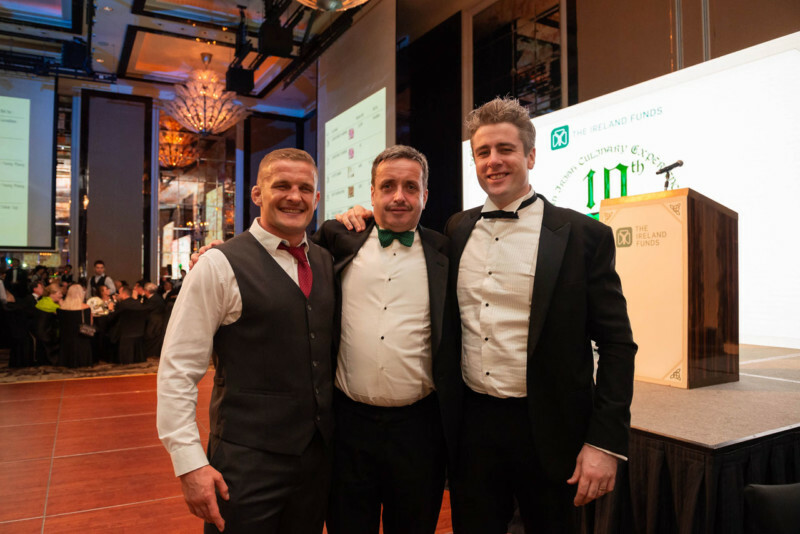 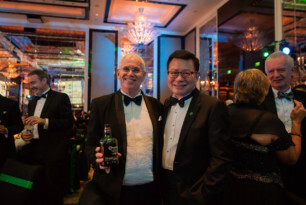 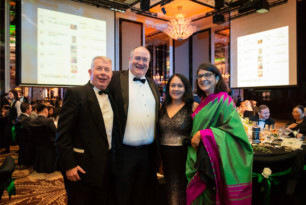 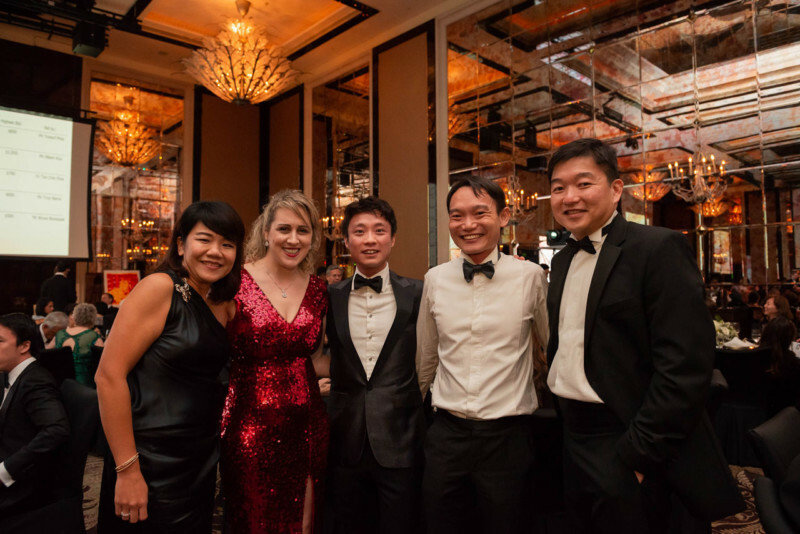 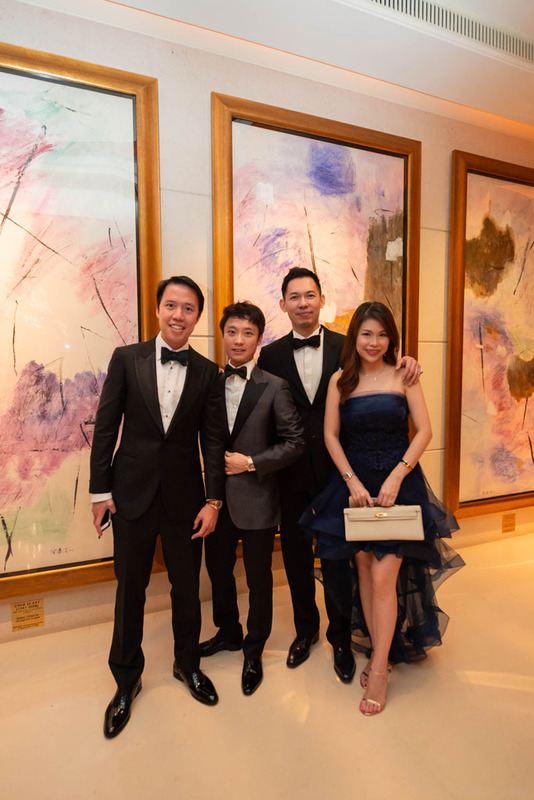 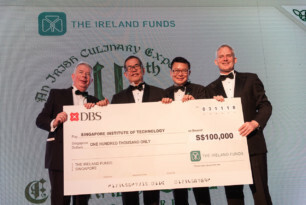 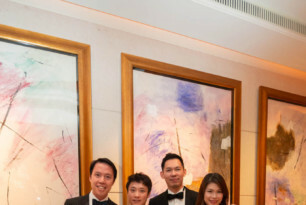 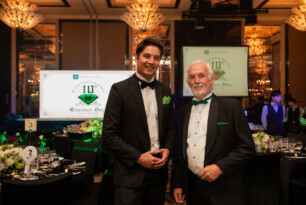 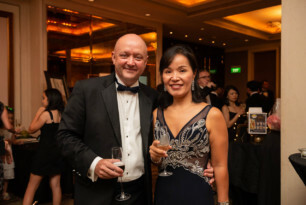 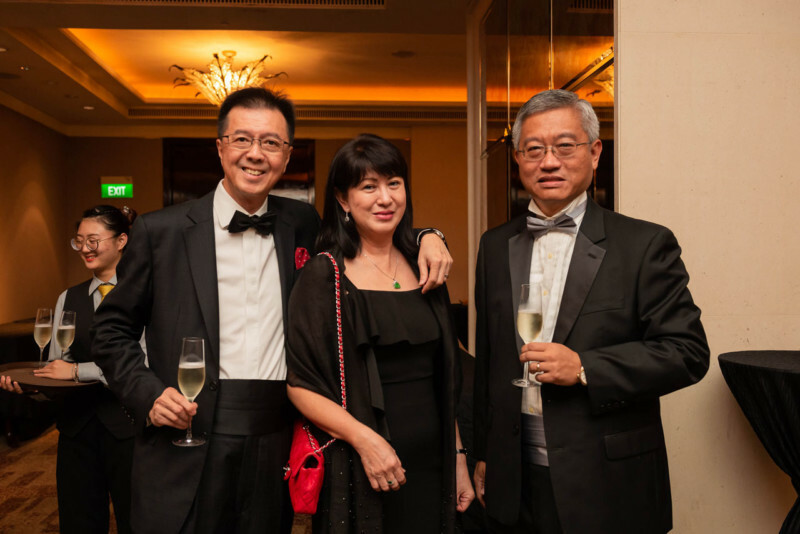 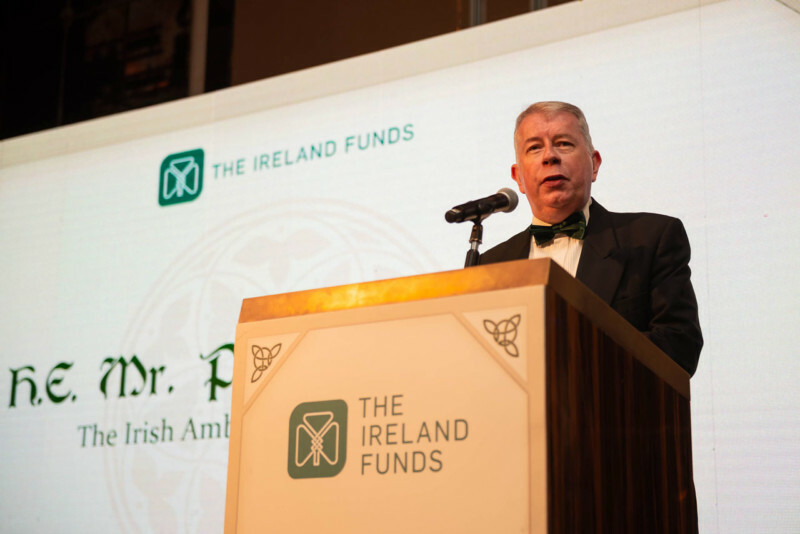 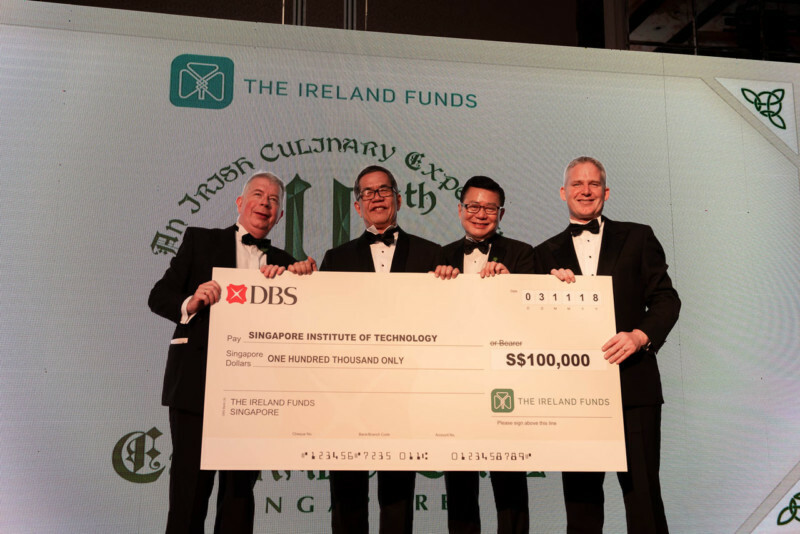 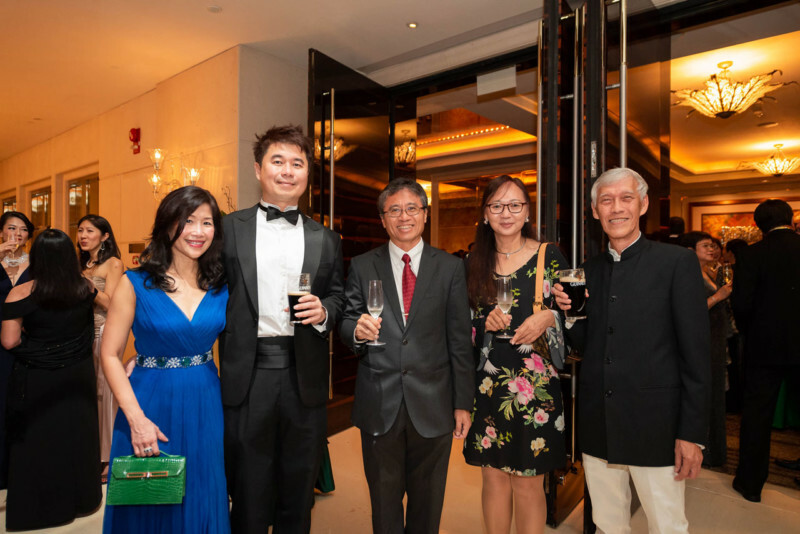 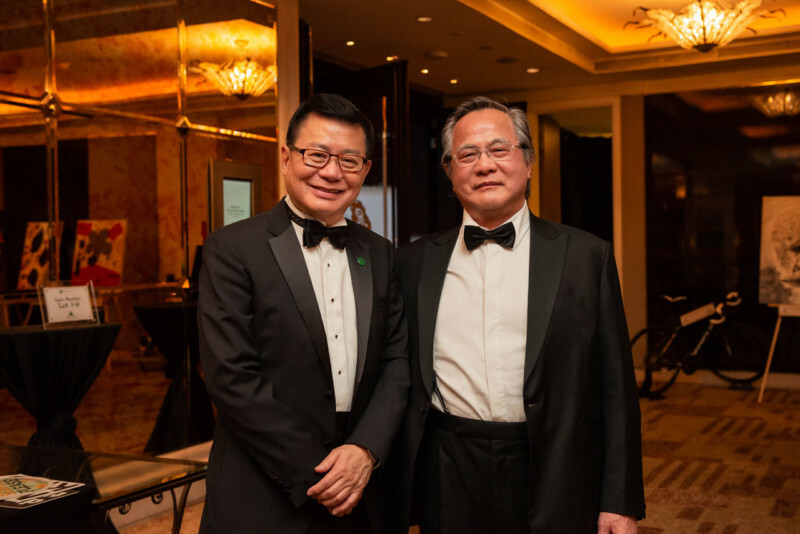 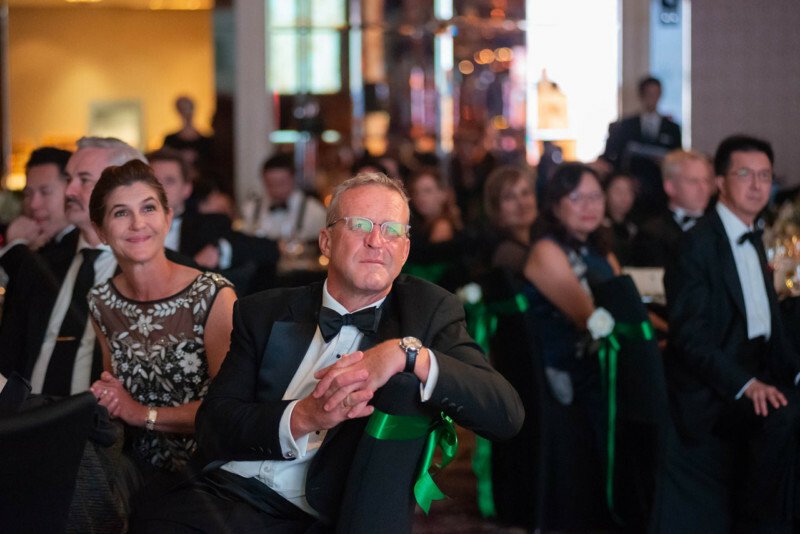 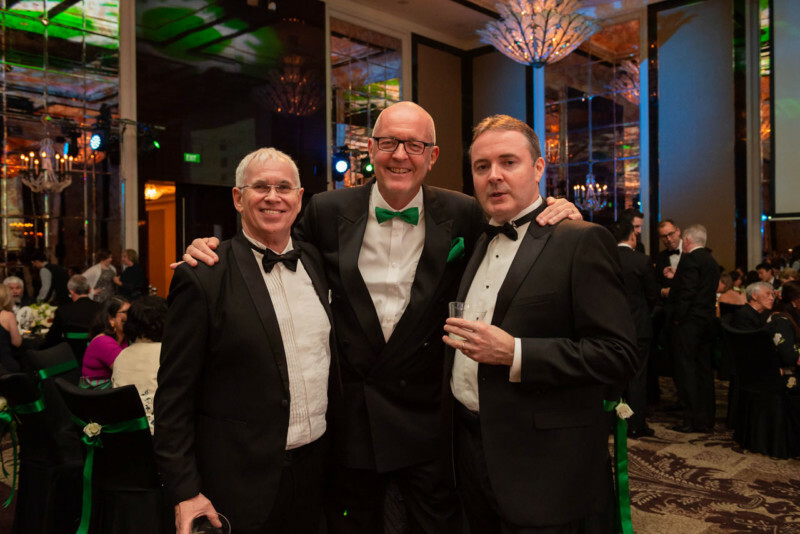 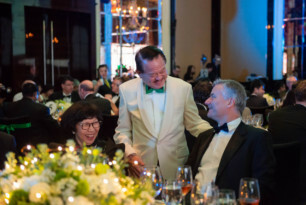 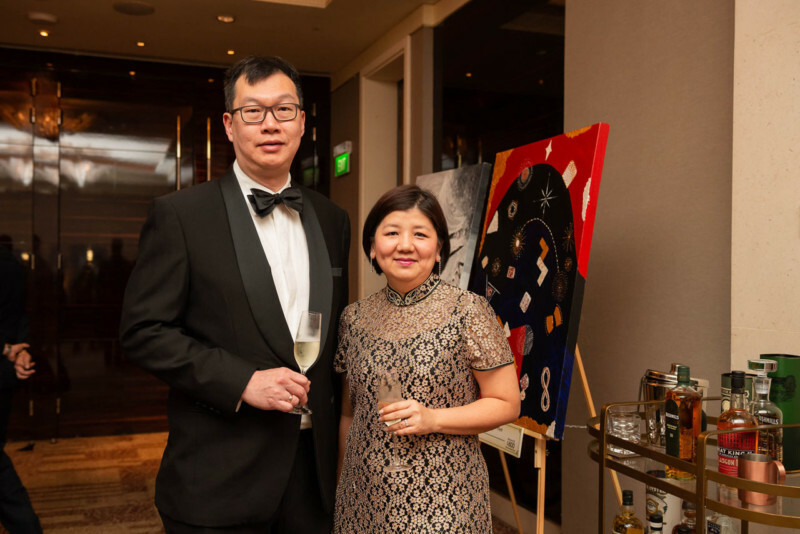 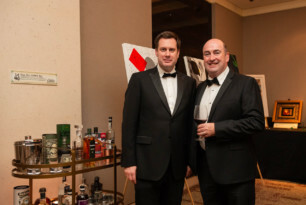 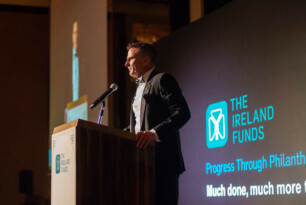 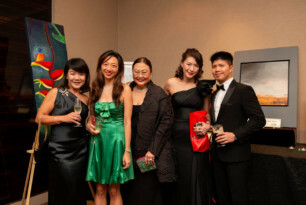 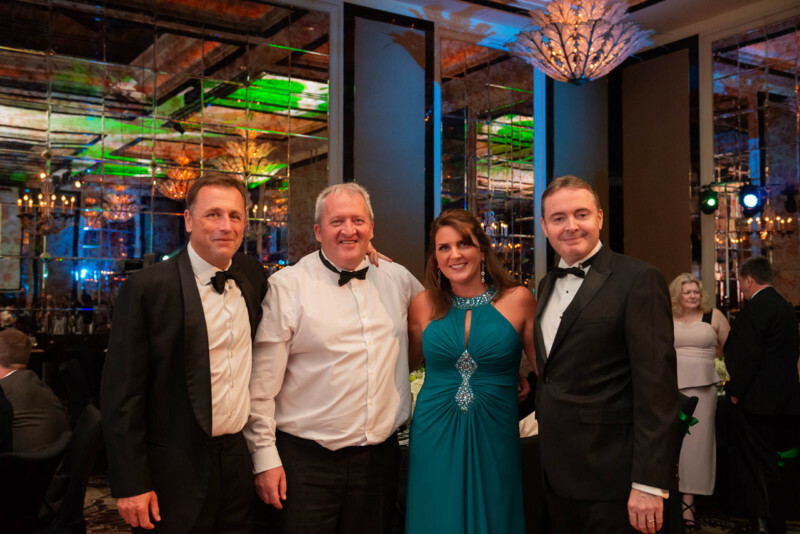 More than 300 people attended The Ireland Funds Singapore’s 10th Emerald Ball in November 2018, where more than SGD$650,000 was raised to fund causes in Singapore which honour the common Asian and Irish values of education, the arts and culture, community development, and sport. 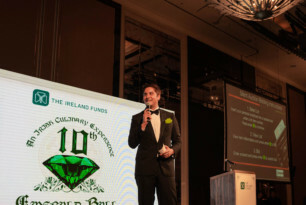 The theme of this year’s event was “An Irish Culinary Experience”, with Chef Andrew Walsh of Cure serving up an Irish inspired menu. 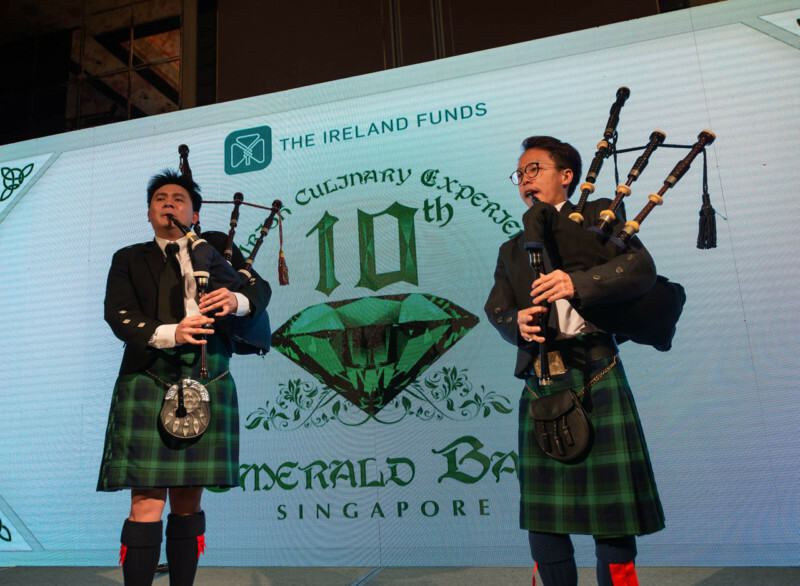 Two pipers accompanied the new Irish Ambassador, Patrick Bourne, his wife Sonali and guests into the ballroom to commence the evening. Emcee, local DJ Shan Wee, opened the event by welcoming guests followed by a wonderful performance of traditional Irish dance by Irish Inspirational Dancers, and guests were treated to entertainment throughout dinner with a musical accompaniment from the The Appeggione Quartet and later from the Singapore Trad Collective. 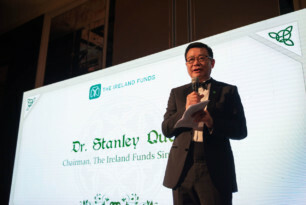 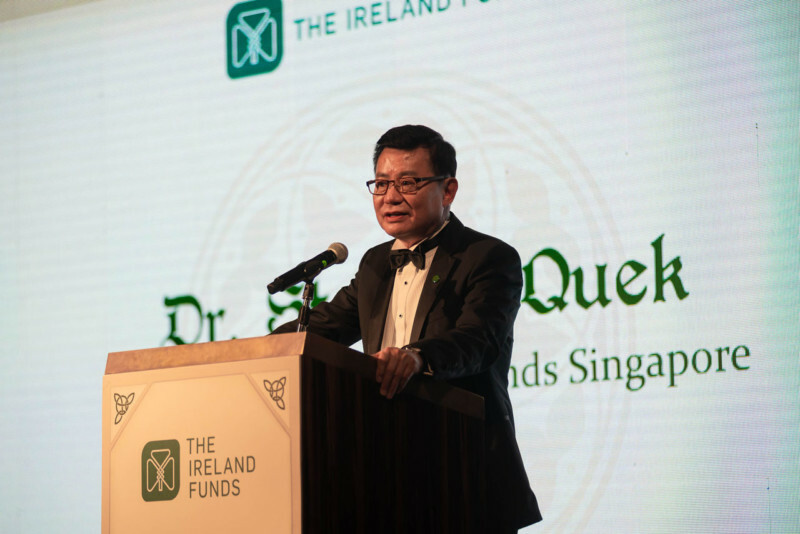 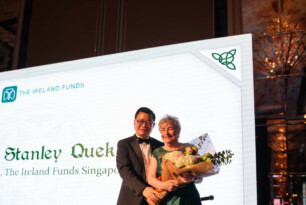 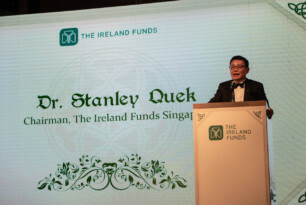 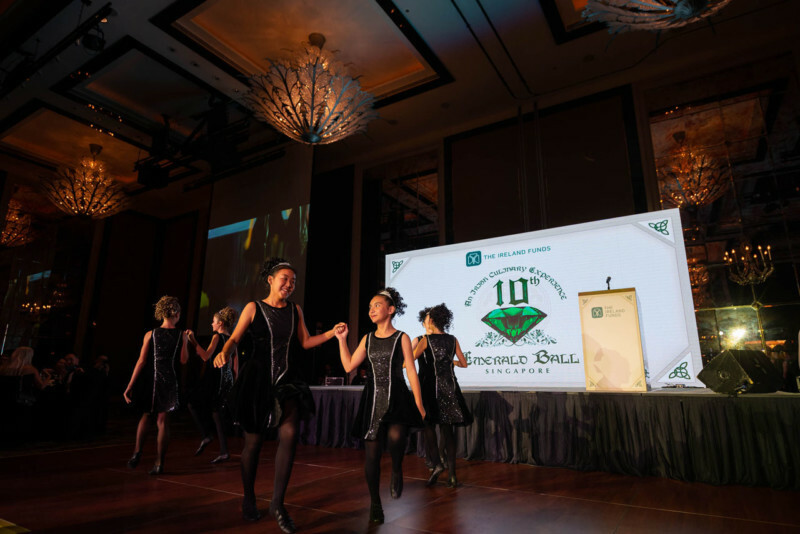 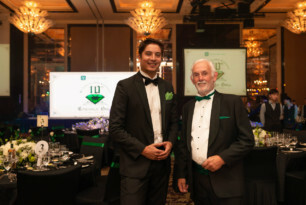 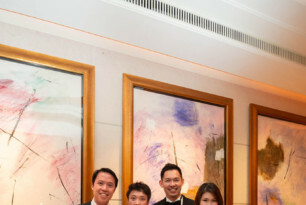 To celebrate the 10th Emerald Ball, Dr Stanley Quek introduced a video showcasing activities and beneficiary organisations that The Ireland Funds Singapore has supported over the last 9 years, with representatives of the all present at the event. 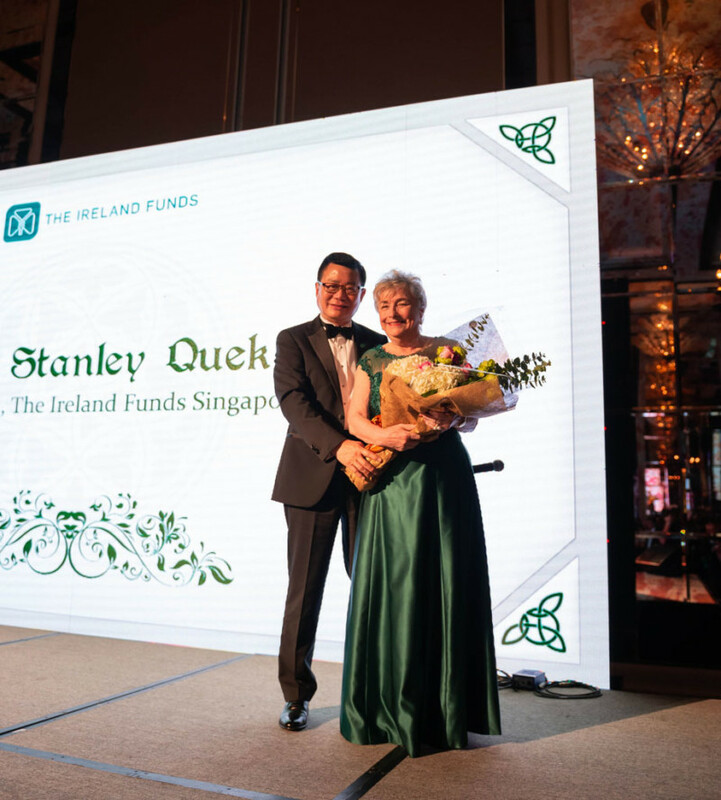 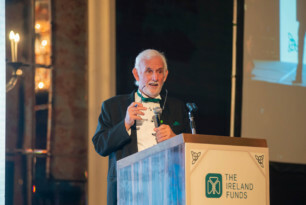 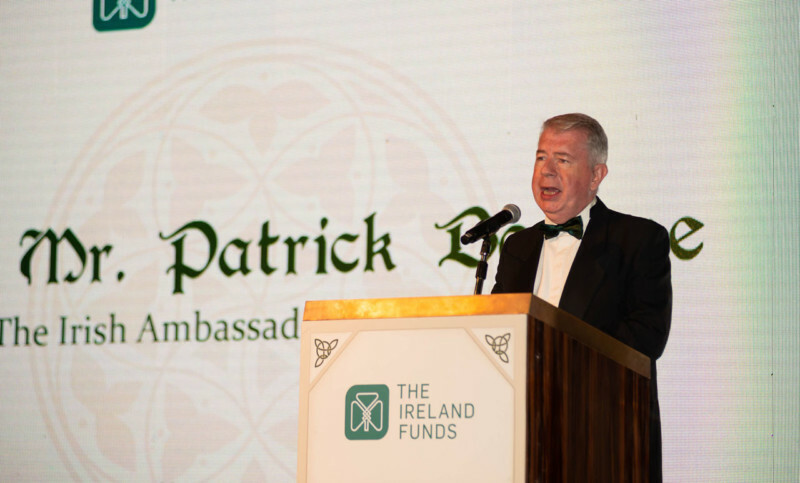 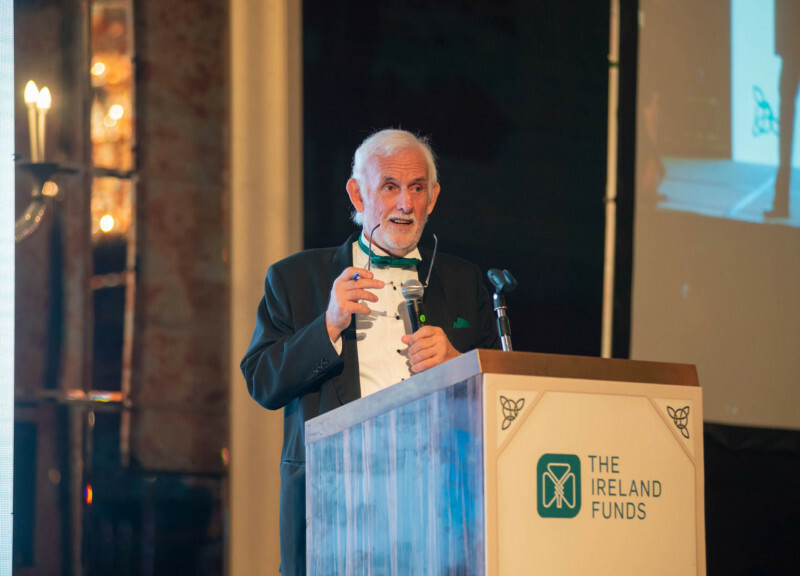 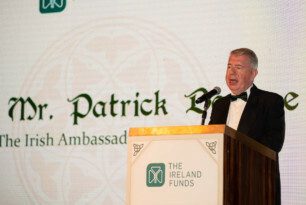 Peter Tierney, Chair of the Causes Committee, spoke passionately on the night shining a light on the real stars of the evening, the causes which The Ireland Funds Singapore supports. 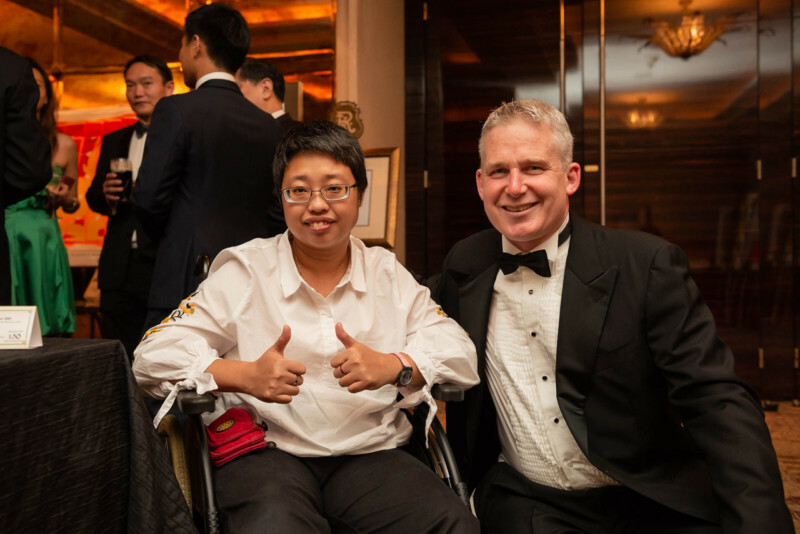 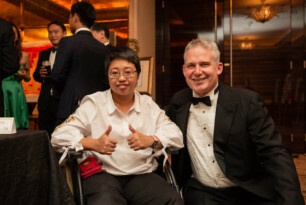 This was reinforced by the wonderful Mary Low who articulated how the contribution to the Cerebral Palsy Alliance Singapore has allowed her to become more independent and set up her own business. 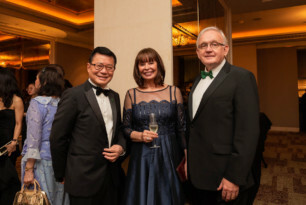 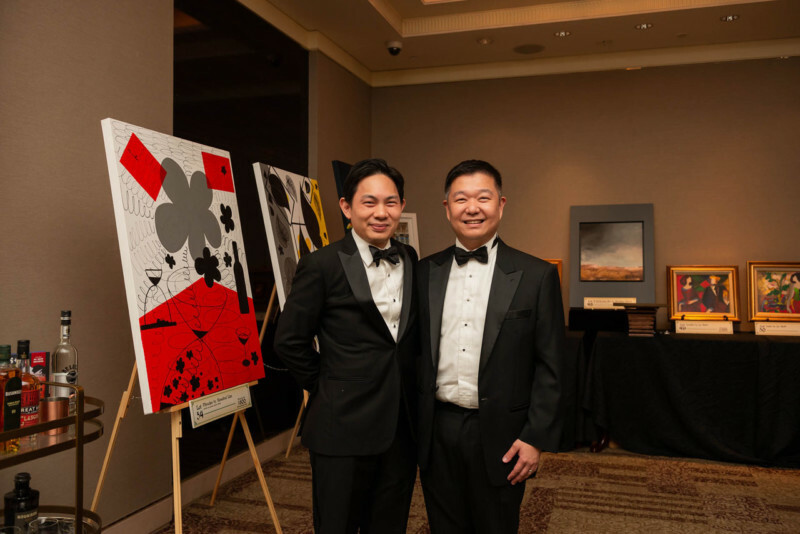 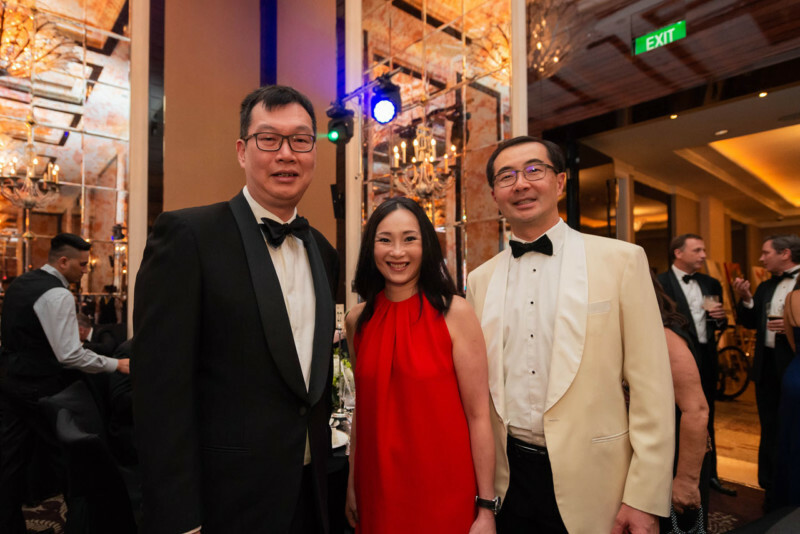 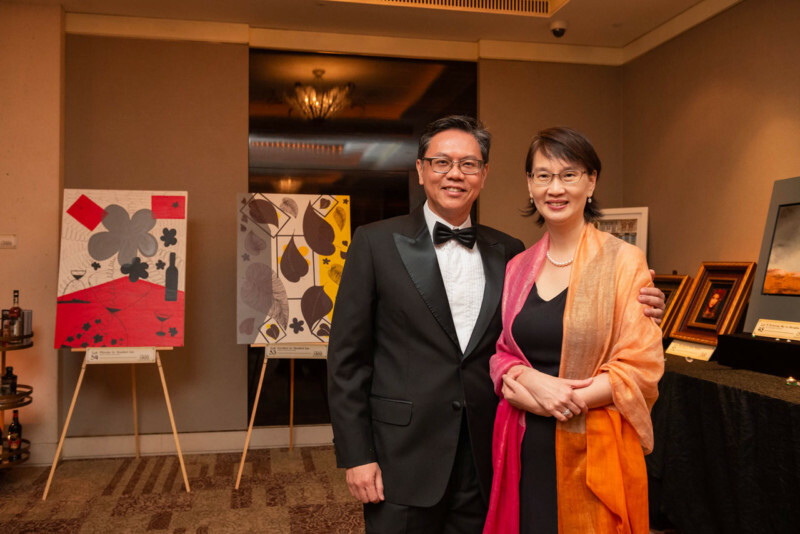 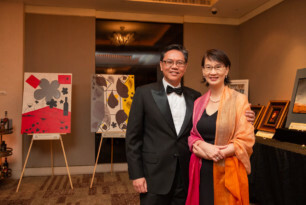 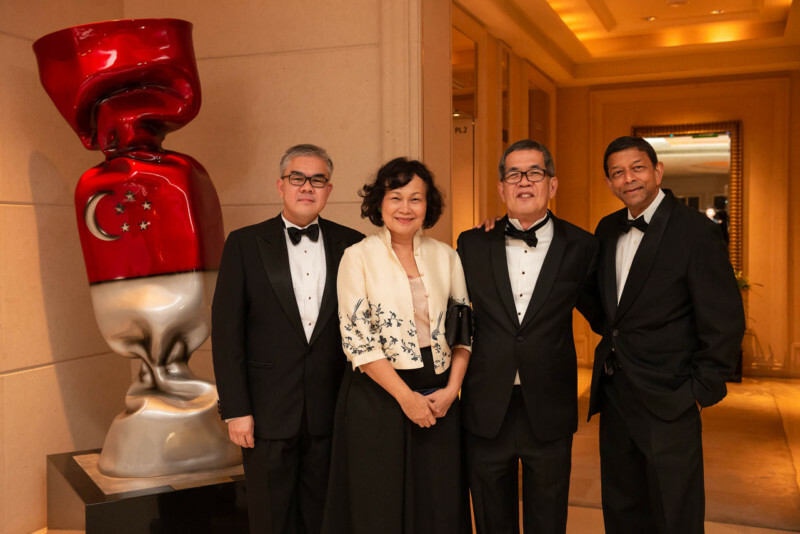 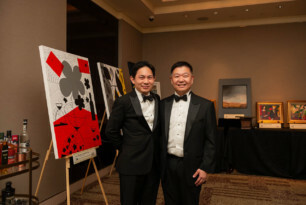 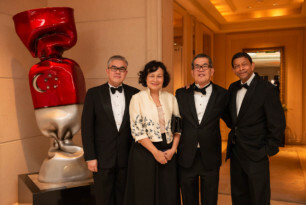 The primary beneficiaries of this year’s ball included the Alzheimer’s Disease Association, the Cerebral Palsy Association Singapore and the Singapore Institute of Technology, with Mr. Paul Hung, Assoc. Professor Kevin Lim and Prof. Thiam Soon Tham respectively receiving cheques on the night. Ball Committee Chairwoman Sheila Lim once again put together a fantastic event with guests enjoying the festivities until the early hours. 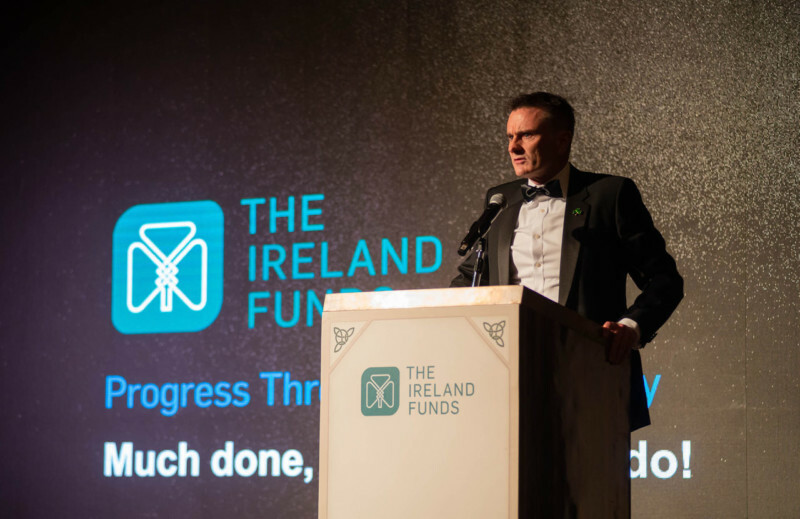 It was a night to remember, and the impact of the donations will live long beyond it!